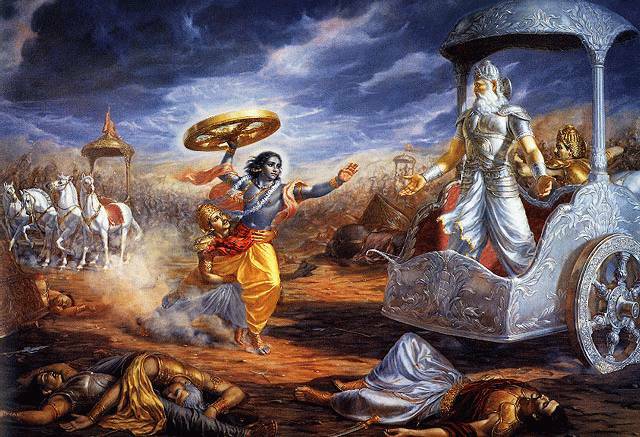 Mahabharata Podcast: Episode 42 - Kidnapped! Episode 42 - Vyasa stops by the Pandava camp and tells the story of Mudgala, who turns down the opportunity to go bodily to heaven because it wasn't permanent enough! He chose instead to stay on earth, eking out his miserable existence until his natural death, when he finally attained total extinction. That seems to be Vyasa's only mission, because after the story, he leaves. Soon after, King Jayadratha of Sindh passes by the camp while the brothers are away hunting. He spots Draupadi alone and undefended, so he grabs her and runs off. The brothers quickly get wind of this and pursue him through the jungle. The princess is retrieved and Jayadratha's followers decimated, but the king himself has his life spared because he happens to be a kinsman of theirs-- he is Ghandari's nephew. Jayadratha is not nearly so forgiving as the Pandavas, and he seeks revenge for the humiliation he suffered during his captivity at the hands of Bhimasena. He lives in the wilderness, worshipping Shiva until the god offers him a boon. After some negotiation, they settle on granting him the ability to stay the brothers during a cavalry attack, except for Arjun, whom even gods have a hard time stopping! Thanks again for your excellent podcasts! My only qualm is that i have to wait a week for each new episode, but then i understand how much material you are sifting thru each week in order to present us listeners with an easily digestible chunk of mahabharata dharma-ness. Just wanted to comment to let you know that your efforts are appreciated. Cheers ol' chap. p.s. I note that you've said only Van Buitenen has attempted an english translation of the critical edition, but others have tried to continue his work. J.L Fitzgerald has published a translation of the critical edition version of books eleven and twelve (the striiparvan and shaantiparvan respectively) and W.J. Johnson has done the same for book ten (the sauptikaparvan). They're all on amazon, last time i checked, tho they're not cheap. Also, the Harivamsha is in the process of being translated by scholars at cardiff university, so watch this space! Thanks for the tips. What I'm going to need pretty soon is a translation of Book 6. v.B. stops with book 5. I am only aware of Ganguli for translations of books 6 thru 9. I'm planning on switching over to Ganguli as my primary/only source once we get to book 6. If you have any other suggestions, I'd love to hear it! Thanks.